The structural pattern of today is the Facade one. A Facade is a class that provides a unified interface to a subsystem, totally abstracting away the concrete classes which compose it. The Client is thus decoupled from the internals of the Facade's module. it should not be a Singleton or a static class; otherwise the global state of the subsystem will be hidden under the Facade, effectively preventing isolation of tests that involve. Imagine test against a database schema you cannot ever reset. Doctrine 1 was fundamentally flawed from this point of view. The Facade should only return and accept interfaces or value objects in its method signatures, so that there are no transitive dependencies. If the Facade gives away references to the internal collaborators of its module, it won't achieve its decoupling goal. The job that the code sample accomplishes is outrageously simple. I know some readers would prefer a real world situation, but often the domain details obscurate the intent of the described pattern. That's why programming languages manuals start with Hello World programs and not with real world situations which bring in thousands of lines of code. // Various classes we want to shield the Client from. In the example, the library vendor or the component's owner is now free to change the internal concrete classes. Moreover, he can still change signatures and move methods between classes, a feature that even by using Abstract Factories to return Adder and its sibling classes cannot be achieved. Only external interfaces are published, while the contracts between internal classes are not refererred to in any way, stimulating internal refactoring and shifting of responsibilities between classes. For instance, we can easily merge or extract classes and introduce collaborators without the Client code being affected. Facade is one of the most powerful decoupling patterns because it hides every unnecessary assumption beyond a heavy curtain, thus preventing change in a software module, which will certainly happen, from spreading in the whole application. One of the most important structural patterns is the Composite one: its goal is managing a hierarchy of objects where both leaf objects and composition of other objects conform to a common interface. This hierarchy is usually constituted by part-whole relationships (often composition in the strict sense or aggregation), and it can be viewed as a tree. The power of the Composite pattern resides in a Client which refers only to a Component interface, the common abstraction between all kinds of tree elements, and it is oblivious to changes in the underlying structure. The Client is not even aware of the hierarchical structure existence and it is passed a reference to the tree head. Meanwhile, the Composite responsibility is to build on its Component children's operations, and propagate their calls towards the bottom of the hierarchical graph until they reach Leafs. Client: sends message to the head Component. Component: declares the interface that various parts of the graph should respect. Leaf: concrete class that has no children. Composite: concrete class that composes other Components (no pun intended). * Represents an <h1> element. * Represents a <p> element. * A Composite implementation, which accepts as children generic Components. * These children may be H1, P or even other Divs. evaluate if maintaining parent references in Component specializations would be a waste of time. This addition prevents sharing of objects as children of different Composites and makes the mutual reference management more complex. often also the remove() operation is not even required in php implementations, because of the transient nature of object graphs. It is rare to modify a tree unless if its objects are entities; service trees such as Chains of responsibility are built via configuration at the startup. the only operation which is really mandatory, besides the ones present in the Component interface, is a way to specify the children, via an add() method or the constructor. a Builder can encapsulate the mechanics of the construction process of the object tree. This article implements the beginner pattern, but it can also be useful to recap the terms we use lightheartedly in discussions about object-oriented programming. directionality: a relationship may be unidirectional (Target has no idea it exists) or bidirectional (Target has an inverse relationship towards Source). There are two ways to obtain an is-a relationship. Inheritance (aka subclassing) is a unidirectional, many-to-one relationship which is commonly declared with the keyword extends in php and other programming languages. Source inherits all the protected and private methods and properties of its unique Target. Implementation is a relationship towards a Target interface where the Source class declares (with the implements keyword) that its public methods conform to Target's signatures definition. A Source can implement multiple Targets, but it does not inherit concrete code from any of them. Subclassing is often abused to exploit the methods inheritance. Moreover, it is a static property because you cannot change the Target superclass at runtime. Substituting it with an implementation often improves the situation because Source can then have multiple parent classes (but you must be careful that a real is-a relationship is still present). An has-a relationship is established when a Source object maintains a field reference to a Target object; this paradigm is applied to collaborators which are used throughout many methods of Source. Has-a relationships are called associations in Uml jargon, and there are two special forms of it. Aggregation is an association which implies a part-owner relationship. It is indicated with an empty diamond in Uml class diagrams. Composition is a particular aggregation in which the parts (which are the Source objects) cannot be shared with other Targets. This difference is reflected by a black diamond. Both specializations have a multiplicity of one. There may be associations which are neither aggregations nor compositions, since they are references to an external service for example. The term composition is often used for antonomasia to indicate every kind of association, particularly in the catch phrase Favor composition over inheritance. If done right (without an hardcoded new operator or creation method), an association is not a static relationship because you can decide at runtime what the pointer on Target or Source links to, as long as the destination object is-a implementation or subclass of the original one. A dependency is established when Source knows Target someway and if we delete Target, the Source class cannot work correctly anymore. Maybe it does not compile, maybe it generates errors or exceptions when certain methods are called. Maybe Source creates Target (if it is a Factory), but the common case is an object passed as a method parameter. Another cases we may encounter is a dependency towards a Singleton. This is an awkward case because the dependency is hidden and the Api does not show it clearly. The same goes for collaborators created in the constructor or methods instead of being asked for. It can be said that the has-a and is-a relationships are stronger cases of dependency, since an hypothetical deletion of the Target breaks Source in both cases. Here's the catch: most of these dependencies cannot be avoided; what we can do is keeping abstractions as Target of dependencies, such as interfaces and base classes. The less code classes depends on, the more decoupled and versatile is the design: interfaces have no code at all (except for method signatures) and are the best thing to depend on in object-oriented programming. They are the ideal point of conjunction of different modules and object graphs. Abstract and base classes have little code too, but they can grow quickly and you can inherit only from one of them, while not being able to change the Target class easily. I hope this formal definitions of relationships will help you better comprehend the articles in the Design Pattern series, especially the ones to come. 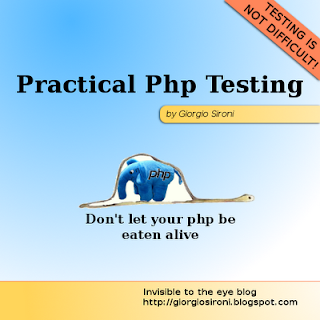 This post starts the Structural patterns part of the Practical Php Pattern series. Structural patterns are concerned with the structure of the object graph, and influence the hierarchy of subclassing, and where to introduce interfaces and associations. The first structural pattern we will touch is the Adapter pattern: an Adapter converts an already existent Adaptee class which presents a not usable (maybe implicit) interface to another Target interface, which other Clients components are ready to use. This pattern is often used to integrate different parts of an application, because it magically makes talk to each other classes which were strangers. You can consider also to modify the classes to improve their relationship, but only if you own them and no backward compatibility is required; the main problem resides in not introducing unnecessary coupling. In php, wrapping functions with a class can be considered an Adapter's implementation. Consider the Zend Framework codebase: it is full of adapters like Zend_Cache backends (which are wrappers) and authentication and database adapters. The full object-oriented case is also present: Zend_Paginator_Adapter_DbSelect is an Adapter for Zend_Paginator (Client) which swallows a Zend_Db_Select instance (Adaptee). Including a dependency on the Paginator would be a source of bloat and coupling for the Zend_Db component, so do not consider an Adapter only as a patch to make different libraries work together: its use is often mandtory even in the same application, to connect areas of different concerns. Client: makes use of an object which implements the Target interface. Target: point of extension for the Client's module. Adaptee: object of a different module or library. Adapter: implementation of Target that forwards real work to the Adaptee, whilst totally hiding him. This is a code sample where the Adaptee is not a class, which is very common in php given the procedural approach of the majority of its extensions. * The Target interface: a small Collection, since php lacks a native one. * The bigger the interface, the greater the hassle while writing Adapters. * The Adaptee is not a class but an array. * it would still be an implementation of the Adapter pattern. In php, there is no private inheritance, so a class adapter (which subclasses the Adaptee) must not be considered as the resulting code would reflect a Decorator pattern instead; an object adapter is the mainstream solution, where the Adapter composes the Adaptee. There is also a choice between leaving abstract methods on the Client, that the Adapter will override so that it will be used directly, and a cleaner solution which favors object composition. The latter, which is presented in the example and in the diagram, consists in having the Adapter classes conform to a narrow and cohesive interface, which is passed to the Client on the stack or during construction. The Target should be kept short, since having twenty-six operations to implement is usually an inconvenience for the developer who has to write an Adapter. This is the fifth post from the Practical Php Pattern series, which will touch the majority of the known design patterns, with a special look at their application in a php context and code samples. Today we will discuss the Singleton pattern, the most controversial creational pattern. A Singleton is a global point of access for a resource that must have only one instance in the whole application: database connections, http streams, and similar objects are the typical examples of such a class. This behavior is implemented trough a static method which returns a lazy-created instance, and by rendering the constructor private to avoid creation of an instance from outside the class code. The problems of a Singleton class are the same of its non object-oriented equivalent: a global variable. The Api of Clients of the Singleton lies, because they do not declare in any signature that they are taking advantage of the Singleton's capabilities; moreover, global mutable state is introduced and encapsulation is disregarded. There is a famous credit card example, which describes the usage of a CreditCard class. One day Misko Hevery was writing some tests in a system he does not know very well, to improve his knowledge of the codebase. The test ran, and at the end of the month he got the bill and see he was out $100! The story is probably made up, but you get the point: if a Client references Singletons, you have no idea of what can happen when calling a method. Have you ever seen a CreditCard that can be used without a POS? In my opinion the classic Singleton pattern is adequate only if the static instance has no state, or it is an utility without side effects which you may want to substitute. The sample code reflects this weltanschauung. There are people that subclass Singletons, but if you feel the need to write a subclass it probably means you are already gone too far. Refactor the code to inject the Singleton as a collaborator of Client. Singleton: class that manages to keep one and only one instance of itself. Client: every class that references a Singleton. * The most harmless example of a Singleton I can think of is a Logger. * Observer pattern would be better here. * An instance of this class is lazy created and returned. * No further instances are created if there is already one available. * This method is the standard way to create a Singleton. * *Little* side effect: it writes a file. // isn't it strange that these two lines write a file on disk? The one instance myth is overrated, and there are other means to achieve the same behavior from a class. Test suites could have dozen of instances of "unique" services and connections (some of them as Fakes and Stubs); in fact, a proof of testability and good design consists in being able to run two applications in the same php script, Jvm or main method. The difference is that maintaining a unique instance is correct, but only within the boundaries of an application. If you control the creation process, your factories will never create more than one instance of a critical resource. Using a Singleton extends this uniqueness along all the execution environment and hides a crucial dependency under the carpet, effectively causing hassle to everyone trying to figure out what is going on, in debugging as in testing. This is the fourth post from the Practical Php Pattern series, which will touch the majority of the known design patterns, with a special look at their application in a php context and code samples. Today we will discuss the Prototype pattern. The creation of objects in an application can be configured by metadata, for example by using Dependency Injection containers, or programmatically, in the case that it is accomplished by writing code. The most customizable option for programmatic creation is the Prototype pattern. This pattern consists in choosing an already existent object, with a clone() operation available, as the base for creating new objects of the same kind. Often the different objects that can be created by a Client are not instances of different ConcretePrototype classes, but different configurations of the same one; in this case the Prototype pattern may be used to provide all the different configurations to the Client, which needs to abstract away the object creation process. management of available instances at runtime, performed simply by adding and removing operations on a collection of cloneable objects. specification of new objects very similar to each other, by cloning an existing one and changing its properties using setters. specification of new objects at runtime; a GoF example is about a circuit design system which lets the user insert already defined circuits as blocks of a new one. The circuits implement a clone() operation which clones all the components recursively. Prototype: interface of the cloneable classes. ConcretePrototype: implements the clone operations (the ones which are not already supported by the language). Client: actually clones Prototype instances to use the clones as new objects. * SECTION 1: a Widget interface and two different implementations. * widgets, the actual instance created here is the Widget itself. * middle of business logic. * usability recommendations. This is the Prototype. * This is one ConcretePrototype. * A collaborator for the next ConcretePrototype. * Implementation that generates html that loads a flash object. * original object, duplicating references to the same collaborators. * new instance substituting some shallow copies with deep ones. * SECTION 2: a Client class which clones instances of BlinkingWidget. * one which will be cloned every time a new one is needed. in languages where a Class object (meta programming) is available, the Prototype pattern is less important because Class objects are already standard prototypes. In Php, the most we can configure is a class name with a string, along with an array that represents a series of constructor options, so it can be considered as a practical solution. main problem is implementing a clone() method, which should produce copies or references to collaborators, a difference that should be decided case-by-case (deep or shallow copies); php has a standard clone operator and __clone() magic method which are used in the code sample; I suggest to refer to the sample and the manual for more information. after the cloning process, it is often suggested to add an initialize() method which allows for setting pieces of state which may differ from the prototype object; for instance, an id or a name field. This method should not be included in the Prototype interface or its parameters be put in the clone() method: first, php does not support cloning with parameters; second, different ConcretePrototypes will need different initialization values or no values at all. As for related creational patterns, Prototype and Abstract Factory are often in competition, but an Abstract Factory might use Prototype instances to create new ones, effectively hiding the cloning from the Client class. Prototype seems a very simple pattern but this post turned out as detail-rich one. Do you feel anything is missing? Add a comment. This is the third post from the Practical Php Pattern series, which will touch the majority of the known design patterns, with a special look at their application in a php context and code samples. The third creational pattern we will study is the Factory Method one. By definition a Factory Method is any method whose responsibility is creating an object, or providing a already existent instance of a particular class. Factory Methods are the seams which allow tuning of an instantiation; for example, to recycle already created objects or to introduce subclasses of the original Product. ConcreteCreators, subclasses of a Creator class, redefine the factory method forcing it to create a ConcreteProduct instead of a generic Product. The subclass term is used here extensively, also to indicate an interface's implementations; the Creator nickname shows that the role of the class in this pattern is creating the Product, but by no means its responsibility consists in creating it: the responsibility of Creator is to accomplish some tasks which requires fresh instances of Product to be created, as a side effect. The responsibility of actually instantiating a ConcreteProduct is usually left to the ConcreteCreators. This pattern has a strong affinity with the Abstract Factory one: usually every relevant method of the Abstract Factory is a Factory Method, but isolated Factory Methods can be used also in other situations. For instance, with the intention of having them overridden by subclasses, incorporating the factory in the class itself and having them called by Template Methods. Factory Methods may be moved out of their class in subsequent refactorings and evolve in an external Abstract Factory. Product: the abstraction of the created object. ConcreteProduct: a subclass or implementation of Product. Creator: the base class, which declares an abstract or default Factory Method. ConcreteCreator: a subclass of the Creator which overrides the Factory Method to return a ConcreteProduct. The code sample reprises the Abstract Factory example and implements the same functionality using only a simple Factory Method. The disadvantage is that subclassing is required to take advantage of this hook. * SECTION 1: a WidgetHelper interface and two different implementations. * usability recommendations. This is the Product. * As always, interfaces in php may be omitted. * This is one ConcreteProduct. * A Template Method which uses the Factory Method. * This is one ConcreteCreator. * Second subclass: creates Flash-based helpers. The testability of code that follows this pattern is still nearly good as with an Abstract Factory; all it takes to mock the creation process is to subclass and override the factory method, which we would do anyway in the test suite with an external ConcreteFactory class and is a standard testing technique. A common misconception is a static version of the Factory Method, which is placed on a Product or ConcreteProduct class and provide a constructor with a fancy name. The original intent was having the method overridden, so if it is implemented as static the goal is not achieved; the trick is that the method should reside on the class that need the instantiation of Product objects, and not on the Product itself. Some versions even propose to maintain a static object pool managed by a static method in the Product class, which is dangerously-equivalent to filling some water bottles with gasoline and amassing them in the car trunk just in case the tank needs to be refilled, throw in a burning match and closing the trunk with the keys inside. Moreover, if the method has references to the subclasses of Product, they become all mutually coupled and depend the one on all the others, forcing to modify the base class in case a new subclass is added. In conclusion, a Factory Method is a non-static overridable creation method, which belongs to the class that needs to instantiate a Product (or to a class composed by it). Remember to comment and propose patterns for inclusion in this series! Php 5.3 is required by the Doctrine 2 ORM and will be probably required for Zend Framework 2.0; php projects should be able to develop for 5.3 without losing the availability of the project web platform for testing and demos. Sourceforge is one of the biggest hosting platforms for open source projects. The Project web platform is the web hosting space available for every project at http://PROJECTNAME.sourceforge.net, which can store sample instances of web applications, such as public demos or development checkouts. This platform provides a mysql database and php 5.2, but I think it's important to help open source projects adopting php 5.3 and its shiny new features, like namespaces and closures, whilst keeping example deployments on the sourceforge.net servers. The Practical Php Patterns series will resume on next Monday. This is the second post from the Practical Php Pattern series, which will touch the majority of the known design patterns, with a special look at their application in a php context. A running code sample will be provided for each part of this series. Continuing the discussion on creational patterns, today we will introduce the Builder pattern, along with a Tree class php example. The Builder pattern's intent is to encapsulate the details (the new operators and other wiring) of the object creation process under a common interface. Though, the Builder can actually change the internal representation of an object, as it is not a black box. Complex object graphs which present some redundancy in construction (like Composite pattern implementations) can be simplified by factoring out most of the wiring in a Builder. In the example, a simple Tree object will be constructed by a DumbUnbalancedTreeBuilder, the ConcreteBuilder of this code sample. The point is to abstract away the actual instantiation and to construct an interface for the building process, which is leveraged by one or more Director classes. The interface can be explicit (Builder participant) or implicitly defined by the public methods of the ConcreteBuilder. Php's duck typing supports this indirect definition of interface when needed. - Director: class that composes a Builder to utilize its methods to control the creation process of the Product. - Builder: interface that presents a high-level abstraction on the actual object graph carving. GoF suggests to create a base abstract class with empty methods instead of an interface, to let the ConcreteBuilders redefine only the methods they are interested in. - ConcreteBuilder: implementation of the Builder. - Product: the final product of a ConcreteBuilder's work. This is the php code sample for this pattern. * left and right branches (other Tree objects). * because of the very different Products that ConcreteBuilders create. * A Director might encapsulate this sample code that uses the Builder. There are several differences between a Builder and an AbstractFactory: AbstractFactory is a black box which returns a complete object basing on previous configuration; it preserves the contract of an AbstractProduct. A Builder allows a step-by-step construction process to take place and provides a finer control over the single collaborators management. In the example, there is not a unique Tree in an application; an AbstractFactory would be good in returning always the same object again and again,relieving the Client class from the responsibility of choosing and configuring it. A Builder is instead good in allowing flexibility of the created object graph while hiding all unnecessary details and logic. Nothing prevents you to reference an AbstractFactory from a Builder, that instantiates the different parts of a Product, effectively separating logic (Builder) from new operators (ConcreteFactory). Did you like this article and the previous one? Please comment and suggest which patterns should be treated extensively in this series. This is the first installment of the Practical Php Patterns series, which would touch the majority of the known design patterns, with a special look at their application in a php context. A running code sample will be provided for each part of this series, along with the theory and the terminology of each pattern. The patterns that will be discussed first, following the original GoF Design Patterns book approach, are the creational ones. Creating object graphs is an essential skill in object-oriented development and correctly addressing the bootstrap of the application and the object instantiation is part of the programming's complexity. The first pattern we will introduce is the Abstract Factory one, also known as Provider or simply as Factory, in its variant which does not include explicit interfaces. The major problem that creational patterns try to solve is that objects need collaborators: we often pass them in the constructor of a Client class to aid decoupling, as every class should know only what it really needs to get its job done. With the verb know I mean that they just know that the other part exist at all. The fundamental principle of asking for things (Dependency Injection) substitutes the naive approach of looking for things or creating them. A Client is simply the generic name of an high-level class which makes use of the collaborators, and occurs frequently in the design patterns Ubiquitous Language. These generic names are known as participants in a pattern, and allow developers to discuss a pattern without referring to a particular implementation. Dependency Injection prescribes to ask for collaborators in the constructor of a Client, or via setters that accepts the collaborator as a parameter to store it for later use. Most of the times collaborators are created at the startup of the application/script, before their Client, to satisfy the dependency. The fallacy here (which is not really a fallacy, since it works most of the time) is evident when the collaborators assume shorter lifecycles. Often objects are created as a result of business logic (a Post or Forum instance, for example, in the middle of a php script), and by the way with a shorter lifecycle of the object that creates them. As another example, they can be lazily created only when necessary. In php's case, lazy creation is mandatory because there is no need to create all kinds of helper objects on every single http request. You certainly do not expect to define all your buttons, links and inputs at the startup in a single object graph: their creation is regulated by an analysis of the request parameters and of the database state. Though, you may want to govern which kind of objects are created: if the names of the ConcreteProduct classes are hardcoded in the Client, you lose the flexibility of Dependency Injection, which provide advantages like real unit testing and decoupled design. The AbstractFactory solution consists in encapsulating the creation process behind an AbstractFactory interface, which may be implemented by how many different ConcreteFactory classes are needed. One of this ConcreteFactory is then injected in the Client that will call its methods to create the objects, when ready. I will finally let the code speak now. * are not even sure that they would be actually used. * usability recommendations. This is the AbstractProduct. * for the creator of these WidgetHelpers, which results in an Abstract Factory. * This is the collaborator which would be injected in the client. * This is one ConcreteFactory. * Second implementation: creates a Flash-based helper. * Third implementation: creates a random type of helper. * or even a mixture of different families or whatever. * instances whenever it wants. * an interface for the Products or the Factories is not mandatory. Often factories in php applications are applications of this pattern without the abstract trait, with a developed dependency towards a ConcreteFactory. With the same pragmatism, different kind of collaborators which are highly related can be placed in the same ConcreteFactory, by adding other creation methods. I hope you now grasp how to build objects at the right time in your application, as lazily as you want, without depending on concrete classes. Tomorrow we will discuss another creational pattern, the Builder one. Don't forget to comment if you like the post or you feel something is missing. Feedback can drive the evolution of this series of articles.